For just 30 quid, it would appear, you can buy a small piece of land and declare yourself nobility! 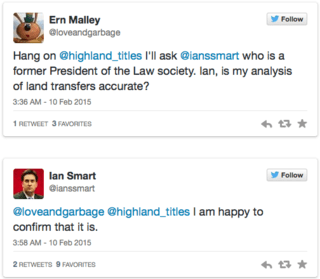 Highland Titles tweeted back, insisting that its business plan was legal and that he didn't know what he was talking about. Further backup also included a law professor at Glasgow University, and at that point it reminded me of the scene in Annie Hall where Woody Allen is arguing with someone and then he steps over and comes back with the professor whose work they're arguing about, and the professor tells the other guy "you know nothing of my work." It's glorious, but you never get to do that in real life. Or at least you didn't before the internet. The above is just a small excerpt of the whole exchange, which is definitely worth reading. Update: Well, of course I remembered that the professor in Annie Hall was Marshall McLuhan, I just didn't happen to mention that. Anyway, it was. According to a source cited by the Wikipedia page, "you know nothing of my work" was "one of McLuhan's most frequent statements to and about those who would disagree with him."